by EG&G Technical Services Inc.
Get this book to start learning all about fuel cells. The book covers Permiable Membrane Fuel Cells (PEMS), Alkaline Fuel Cells (AFC) like those used in the space program, Phosphoric Acid Fuel Cells (PAFC), Solid Oxide Fuel Cells (SOFC) which are the high temp fuel cells that are used by Bloom Fuel Cells to convert natural gas directly to electricity at fuel cell effeciencies. The book also coves Molten Carbonate Fuel Cells (MCFC) which is a close cousin to SOFC. The book covers stationary use as well as mobile and vehicle use of fuel cells. The book is a treasure of learning about fuel cells. Fuel cells are one of the cleanest and most efficient technologies for generating electricity. Since there is no combustion, there are none of the pollutants commonly produced by boilers and furnaces. For systems designed to consume hydrogen directly, the only products are electricity, water and heat. 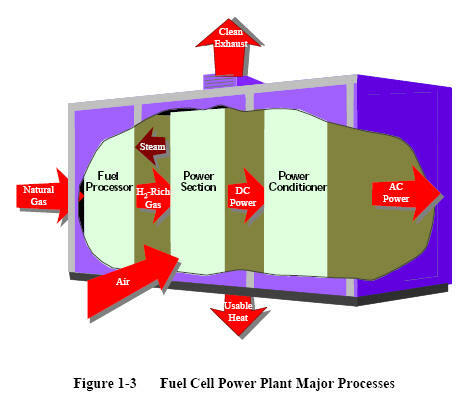 Fuel cells are an important technology for a potentially wide variety of applications including on-site electric power for households and commercial buildings; supplemental or auxiliary power to support car, truck and aircraft systems; power for personal, mass and commercial transportation; and the modular addition by utilities of new power generation closely tailored to meet growth in power consumption. These applications will be in a large number of industries worldwide. This Handbook provides a foundation in fuel cells for persons wanting a better understanding of the technology, its benefits, and the systems issues that influence its application. Trends in technology are discussed, including next-generation concepts that promise ultra-high efficiency and low cost, while providing exceptionally clean power plant systems. 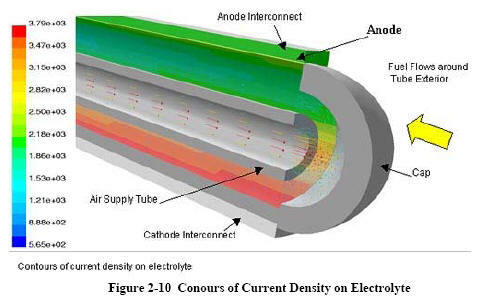 Polymer electrolyte, alkaline, phosphoric acid, molten carbonate, and solid oxide fuel cell technology descriptions have been updated from the previous edition. Manufacturers are focusing on reducing fuel cell life cycle costs. In this edition, over 5,000 fuel cell patent abstracts, and their claims have been included. In addition, the handbook features a new fuel cell power conditioning section, and overviews on the hydrogen industry and rare earth minerals market. the processes of a fuel cell power plant system. The interest in terrestrial applications of fuel cells is driven primarily by their potential for high efficiency and very low environmental impact (virtually no acid gas or solid emissions). Efficiencies of present fuel cell plants are in the range of 30 to 55 percent based on the lower heating value (LHV) of the fuel. Hybrid fuel cell/reheat gas turbine cycles that offer efficiencies greater than 70 percent LHV, using demonstrated cell performance, have been proposed. Figure 1-4 illustrates demonstrated low emissions of installed PAFC units compared to the Los Angeles Basin (South Coast Air Quality Management District) requirements, the strictest requirements in the U. S. Measured emissions from the PAFC unit are < 1 ppm of NOX, 4 ppm of CO, and <1 ppm of reactive organic gases (non-methane) (5). In addition, fuel cells operate at a constant temperature, and the heat from the electrochemical reaction is available for cogeneration applications. Table summarizes the impact of the major constituents within fuel gases on the various fuel cells. The reader is referred to Sections 3 through 7 for detail on trace contaminants. A wide variety of fuel cell models has been developed. While fundamentally the constitutive equations such as those described in this chapter underlie all models, their level of detail, level of aggregation, and numerical implementation method vary widely. 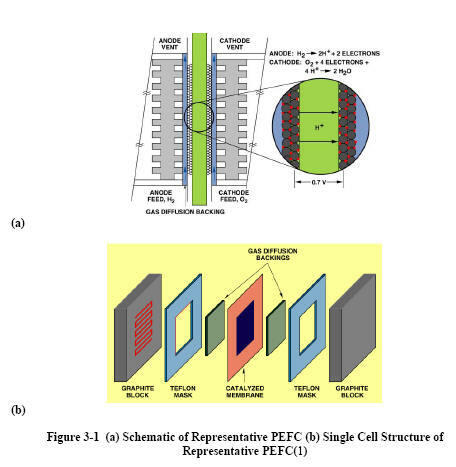 A useful categorization of fuel cell models is made by level of aggregation, as shown in Figure 2-9. As implied in the figure, the outputs of the more detailed fundamental models can be used in lower-order models. This flow of information is, in fact, a critical application for high fidelity models. Recently, much work has been done in the development of algorithms to integrate or embed high-fidelity models into system analysis simulation tools. The National Energy Technology Laboratory (NETL) developed a 3-dimensional computational fluid dynamics (CFD) model to allow stack developers to reduce time-consuming build-and-test efforts. 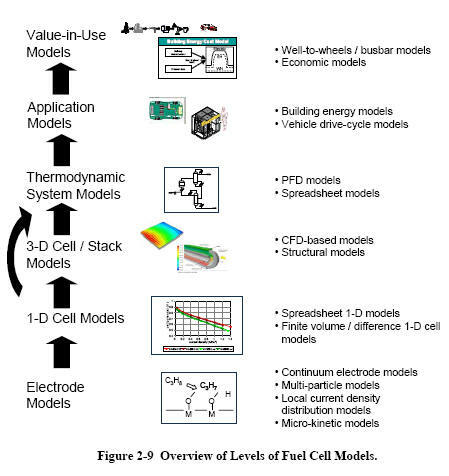 As opposed to systems models, 3-dimensional CFD models can address critical issues such as temperature profiles and fuel utilization; important considerations in fuel cell development. CFD analysis computes local fluid velocity, pressure, and temperature throughout the region of interest for problems with complex geometries and boundary conditions. By coupling the CFD­predicted fluid flow behavior with the electrochemistry and accompanying thermodynamics, detailed predictions are possible. Improved knowledge of temperature and flow conditions at all points in the fuel cell lead to improved design and performance of the unit. · cell interconnects and flowplates that deliver the fuel and oxidant to reactive sites via flow channels and electrically connect the cells (Figure 3-1). The electrochemical reactions occur on highly dispersed electro-catalyst particles supported on carbon black. Platinum (Pt) or Pt alloys are used as the catalyst at both electrodes. There are two alternate approaches to internal reforming molten carbonate cells: indirect internal reforming (IIR) and direct internal reforming (DIR). In the first approach, the reformer section is separate, but adjacent to the fuel cell anode. This cell takes advantage of the close-coupled thermal benefit where the exothermic heat of the cell reaction can be used for the endothermic reforming reaction. Another advantage is that the reformer and the cell environments do not have a direct physical effect on each other. A disadvantage is that the conversion of methane to hydrogen is not promoted as well as in the direct approach. In the DIR cell, hydrogen consumption reduces its partial pressure, thus driving the methane reforming reaction, Equation (6-34), to the right. Figure 6-12 depicts one developer's approach where IIR and DIR have been combined.